A few days ago I went to a secret location in the heart of London for hands on demo with upcoming PlayStation 4 exclusive, Infamous: Second Son, the follow up to the superhero spectacular Infamous 1 and 2. With a new hero and a heap of new powers to get to grips with, how is the third game in the series holding up? If you're one of the 6 million odd people to have bought a PlayStation 4 in the last couple months, then Infamous: Second Son is probably already in the top ranks of your next gen buy list and believe me, the game is everything I'd hoped it would be. 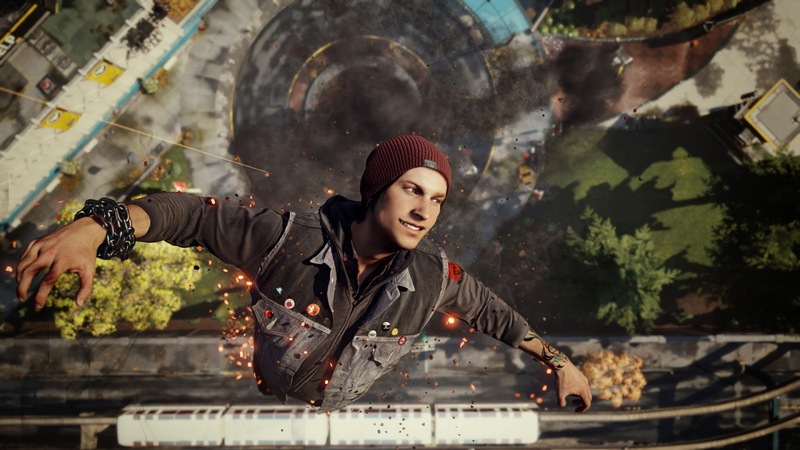 Second Son takes place in Seattle and you play as new protagonist Delsin Rowe, known as a Conduit (a super powered human) who can either save the city or choose to ruin everyone else's life and destroy it. At pivotal moments in the story, you're given choices that you can make that will help you in whichever path you decide to walk. These decisions will change the game around you by making the people around you react differently to your presence; if you're a good guy citizens will praise you, but be savage and they'll cower or run in fear. You also meet other Conduit's who can either help you with the fight against the controlling Governments, or corrupt them to force them to do evil with you. Can't wait to swoop down from heights like this! It's not just the big decisions that will shift the games dynamic, everything you do in the world can swing your moral compass between ultimate good or evil. After the events of Infamous 1 and 2, a nationwide security force known as the Department of Unified Protection (DUP) has been put in place to control Conduits who all have been labelled as bioterrorists. When coming up against DUP forces, you can either choose to take them out in a tactile disabling manor by restraining them, or by shooting them in the face with lightning and putting them down for good. As for the regular inhabitants of the city, you can choose to help or hinder them as much as you want or just leave them to do as they please. See the whole event which was live streamed below! Being a superhuman you're not limited to just walking around on the ground, while you can't fly, you can run up walls and jump very high and then glide around, slowing your descent. The different ways you can traverse the city all blend fluidly and with the fidelity of the controls, you never feel restricted in what you can do. Also during the demo I got to sample 2 different powers, neon and smoke. To select between different abilities you use the touch pad on the controller, while near a source of your power of choice, you absorb that particular energy. With each different power, you gain access to certain special abilities such as throwing electrical charges like grenades, or using the smoke ability you can turn into smoke itself and fly up through air vents to gain access to rooftops. Although I only had a short while with demo, I've got to say I thoroughly enjoyed it, the visuals are stunning and all the special effects of the powers really show off what the PlayStation 4 can do. I'm also intrigued at what other powers will be in the full game, guess we'll find out in just over a week!